MISSION, KS--(Marketwire - February 15, 2010) - (Family Features) Movie lovers, rejoice -- the 82nd Academy Awards will be presented on March 7, 2010. This year, there are 10 Best Picture nominees -- double last year's nominations. In honor of the 10 nominees, here are 10 tips from Pop Secret for hosting a fun awards night party. Star-Studded Invitations. Create your own glamorous invitations or send out glitzy -- and free -- online invitations. Be sure you send them out well in advance and include the dress code. The Sound of Music. Put together a CD or iTunes list with recognizable movie theme songs that can be playing when guests arrive. For bonus fun, see how many songs your guests can match up to their movies. Silver Screen Seating. Make sure you have ample -- and comfortable -- seating available. The ceremony is long, so bring in extra chairs and even floor pillows to keep guests comfortable. Divine Décor. Glam it up or kitsch it up as much as you like. Glitter, tinsel, stars, movie posters and DVD covers can set the stage for a fun night celebrating movies. Play Paparazzi. Make guests feel like they're on the red carpet by taking plenty of pictures - both posed and candid. When the party's over, put together a slide show you can upload or email as a thank you for coming. A Green Room. Celebrities relax backstage in waiting areas called green rooms. Some of your guests may want to take a break from the broadcast, so have other areas set up away from the main screen so they can mingle and talk. Pick the Winners. Print ballots and have guests make their predictions before the awards start getting handed out. The one with the most correct guesses wins a prize. Strut Your Stuff. Test everyone's film knowledge with movie trivia questions during commercial breaks. Have a prize for the one who has the most correct answers at the end of the night. Play Award Show Bingo. Keep it fun by keeping track of tears, long speeches and flat jokes. Create bingo cards with categories such as "Crying Actress," "Long Winded," and "Bad Joke." Feed the Fans. Have plenty of snack and finger foods available, as well as a mix of beverages. Movie lovers will be expecting popcorn, so keep them satisfied with a variety of flavors such as Homestyle and Movie Theater Butter from Pop Secret. Having a popcorn bar available with different toppings lets guests customize their popcorn. Topping ideas may include chocolate candies, grated cheese, and nuts. VIP Tour of Warner Bros Studio, and more! 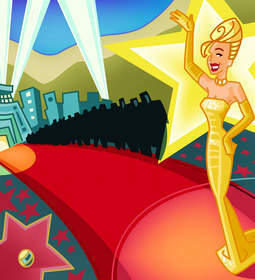 Visit popsecret.com to enter the Hollywood VIP Experience for your chance to win hundreds of prizes.